In January of 1793, King Louis XVI of France literally lost his head, ushering in what history would call the "Reign of Terror." The French Revolution, though founded on the lofty principles of the American model, descended into the chaos and bloody wars of the Napoleonic Era. Across the Atlantic, however, the United States with its revolutionary struggles long past was now busy getting down to business. Promoting business and trade was high on Congress' agenda, and establishing a sovereign coinage system was one of its earliest acts. The Coinage Act of April 2, 1792 authorized the Mint and prescribed the standards for the new federal decimal coinage. 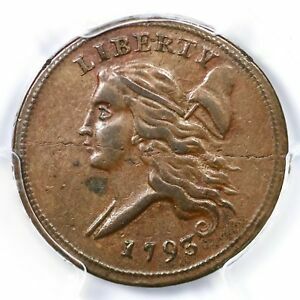 The smallest denomination provided for in the law was the copper half cent, first struck in July 1793, just four months after the Chain cent appeared. Equal to 1/200th of a dollar, the half cent had more spending power than many modern Americans realize. A dollar in 1793 was a respectable amount of money, although no U.S. dollar coins would be struck for another year. Instead, the new copper cents and half cents would be fractions of the Spanish milled dollar or Piece of Eight, the hefty silver coin struck in both Spanish and Latin American mints. Widely used throughout the Western Hemisphere, the Spanish coins were very familiar to Americans and served as the basis for the U.S. silver dollar coin issued in 1794. Since the Spanish fractional one real or bit was equal to 12-1/2 cents in decimal coinage, a half cent was necessary for making honest change. Few Americans living away from the Atlantic seaboard, however, actually handled many of these "Little Half Sisters," as copper coinage student Dr. Warren A. Lapp once nicknamed the denomination. Although half cents were issued for more than 60 years, they remained America's unwanted coins. They proved to be of little use, circulated grudgingly if at all, and were often kept in dead storage at the Mint waiting for infrequent orders from the infant nation's banks. Production, sometimes for several years, was often interrupted by shortages of copper and lack of demand. This small denomination may have suffered from identification with the poorest classes: They were supposed to be its biggest users, at least according to Robert Morris, the Revolutionary War financier and one of the architects of the U.S. coinage system. Morris subscribed to the age-old but misguided view that smaller denominations brought lower prices, allowing the poor to purchase more with their money. Unfortunately, not only did the public have little use for half cents, but for generations, collectors also ignored the little copper coins. Only recently has a birth of interest been sparked, with the publication of new definitive works in the mid-1980s: American Half Cents, the "Little Half Sisters" by Roger Cohen and Walter Breen's Encyclopedia of United States Half Cents have attracted many new devotees to this long overlooked denomination. 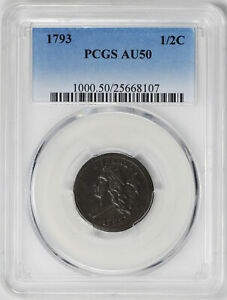 The first United States Mint Director, the eminent but aging scientist David Rittenhouse, was inspired in his choice of the first half cent obverse by French medalist Augustin Dupre's Libertas Americana Medal of 1783. This bold example of medallic propaganda was struck in Paris under the auspices of American envoy Benjamin Franklin, who sought to publicize American Liberty and the Continental Army victories at Saratoga and Yorktown. Dupre depicted the spirit of Liberty as a young woman with streaming locks of hair flowing in the wind of freedom. Behind her head he placed a pole supporting the pileus or ancient cap of liberty. Franklin felt this medal would help to enhance American-French goodwill, and to some extent it did. 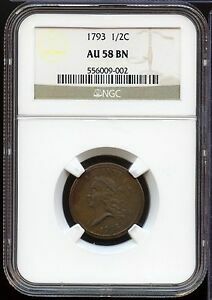 Numismatic researchers believe that coiner Adam Eckfeldt cut the dies for the new half cent, assisted by engravers Joseph Wright and Robert Birch. Eckfeldt was an expert machinist and talented "jack of all trades" whose ability to improvise kept the Mint alive despite critical shortages of copper, die steel and skilled craftsmen. Production began in late July and continued into September 1793. The Mint was then closed, and the staff fled the annual yellow fever epidemic, which in that year claimed the life of the newly-hired Wright. During its first year, the fledgling United States Mint managed to find enough metal to strike 35,334 of the new half cents. Only about 550 specimens exist today, the majority in the lower circulated grades, with Very Fine to About Uncirculated examples only occasionally available. About 20 survivors are in mint state, some showing evidence of being made with particular care, most likely as souvenir examples destined for VIPS. 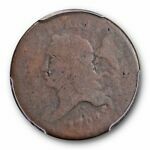 The 1793 half cent is eagerly sought by collectors, as this issue is not only the first year of the denomination but also a one-year type coin. Wear first shows on this design on the hair above Liberty's brow and behind her ear and also on her shoulder. On the reverse, check the leaves above the H in HALF. Coining the cents and half cents of this date kept the new Mint staff busy and gaining in skill until all personnel connected with silver or gold coinage could post the high bonds required by Congress. President Washington ultimately agreed to Rittenhouse's request that the bonds be lowered to a more reasonable figure, but meanwhile the coppers kept the machinery in motion. Without the copper coinage, which was neither legal tender nor of precious metal, the Mint's already rough road would have been far rougher. After Joseph Wright's death, Rittenhouse hired Robert Scot as Chief Engraver. A watchmaker and banknote engraver of some repute, Scot's talents as a die-cutter proved to be marginal at best. 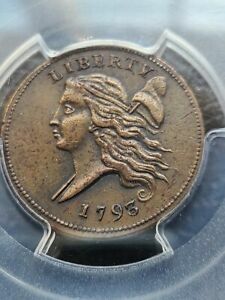 In 1794, Scot modified the half cent design, enlarging Liberty's head and cap and facing the head to the right. This Liberty Cap design, with several modifications, was issued through 1797. Alexander, David T., DeLorey, Thomas K. and Reed, P. Bradley, Coin World Comprehensive Catalog & Encyclopedia of United States Coins, World Almanac-Pharos Books, New York, 1990.